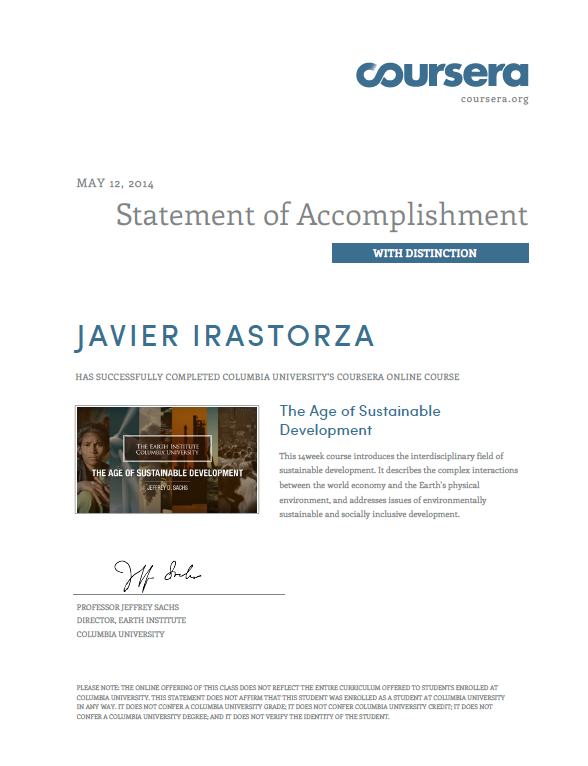 A few months ago I took a massive open online course (MOOC) on Coursera platform titled “The Age of Sustainable Development” of which I wanted to talk in the blog. The course is taught by Jeffrey Sachs, an American economist and Director of The Earth Institute at Columbia University. Jeffrey Sachs’ main fields of work include the challenges of economic development, environmental sustainability, poverty alleviation, debt cancellation, and globalization. Sachs is the Quetelet Professor of Sustainable Development at Columbia’s School of International and Public Affairs and a Professor of Health Policy and Management at Columbia’s School of Public Health, previously he was a professor at Harvard where stayed for 19 years. He is Special Adviser to United Nations Secretary-General Ban Ki-Moon on the Millennium Development Goals, having held the same position under former UN Secretary-General Kofi Annan. This MOOC provides an introduction to the interdisciplinary field of sustainable development, and draws upon the most recent developments in the social, policy and physical sciences. It describes the complex interactions between the world economy and the Earth’s physical environment, and addresses issues of environmentally sustainable and socially inclusive development. By the end of this course, students will gain a broad overview of the key challenges and potential solutions to achieve development in the 21st century. Taking this course was a very good experience. It took 14 weeks (rather long for my taste with MOOCs), in which a good variety of topics were presented. It called my attention the abundance of materials reviewed in the course, the many sources and online applications which we had to work with along the course (1), the course-specific text book that had been put in place (between 25-35 pages per week), the videos with lectures by professor Sachs, etc. The syllabus of the course departed with an introduction to sustainable development, economic development to then tackle poverty and the millennium development goals, where it reviewed the progress on some of them and lack of progress in some others. Finally it presented the sustainable development goals, which the UN shall adopt next year. End extreme poverty including hunger. Ensure effective learning for all children and for youth for their lives and their livelihoods. Achieve gender equality, social inclusion, and human rights for all. Improve agricultural systems and raise rural productivity. I definitely recommend this course, of which a new edition is about to start next week! Statement of Accomplishment of the course.